The Man-at-legs (ダマグモキャノン?, lit. 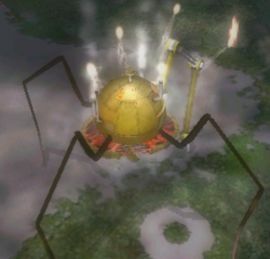 : "Cannon Orb Spider") is a member of the Arachnorb family, and first appeared as a boss in Pikmin 2. It's one of the few bio-mechanical creatures featured in the game, having a mostly mechanical torso sheathed in metal with four spindly legs – three of them are black, organic and spider-like, while the other one is mechanical; this makes attacking its feet impossible. Several exhaust pipes on its body continually emit smoke. Unlike other Arachnorbs, it has no flat footpads to stomp Pikmin with, instead relying on its long-ranged attacks and speed, quickly skittering around the room to avoid being attacked. When agitated, it stops in place, the panels of its underbelly separate and a machine gun-like weapon extends out, tracking any nearby targets via a laser sight before rapidly firing a barrage of explosive rounds at whatever it manages to lock-on to. After firing a few dozen shots, with minimal breaks in-between, it sheathes its weapon before continuing to move about. While moving, it will occasionally stand still to rest, and at this point, mechanical-sounding inhales can be heard. Its interior appears to be filaments of biological matter that stretch to allow its gun to fold out. The creature is not without its flaws, though: it lets off steam with a loud hiss before it attacks, signaling Olimar's retreat, and there is a visible red laser it uses to target the Pikmin, making it obvious where it's going to shoot. However, the blasts come very quickly, so the laser is not of much use when avoiding the enemy. The Man-at-Legs is not in control of its attacks, as stated by Olimar's notes. In typical Arachnorb manner, it leaves no body behind upon dying. However, instead of slowly disintegrating like its two relatives, it freezes and releases lots of steam while shaking a bit, before exploding violently. This boss is usually found in arenas that have raised ground that can be used as shields against the blasts. It is only found on the last sublevel (9) of the Subterranean Complex, sublevel 13 of the Hole of Heroes, and sublevel 2 of the Secret Testing Range in Challenge Mode. As a side note, it cannot be petrified while it is dormant. When the creature has fully risen from the ground and starts aiming, the player should run for cover behind an object. Once it starts walking around, it should be chased. It is most easily attacked when it stands still and lowers its head. When it shakes the Pikmin attacking it off in a fury, the player should hide again, and repeat the cycle. A large mob of Purple Pikmin thrown at this enemy while it lies dormant in the ground should drop its health to a substantial fraction. Once it has risen fully, the first or third strategy should be used. The creature is attacked until it has stood up all the way, and at that point it is petrified. As soon as the spray wears off, it should be petrified again. However, occasionally the Man-at-Legs will exit the stun and start shooting immediately, without the aiming laser. Before the creature opens fire, the player can dismiss their Pikmin away from the Man-at-Legs and run in tight circles around its legs. As long as Olimar is closer to the creature than the Pikmin, he will be shot at, and with skill, unharmed. This strategy is easier to perform after obtaining the Rush Boots. Unfortunately, the player faces the Man-at-Legs in a watery area two out of three times, leaving the aforementioned strategy of Purple Pikmin useless. In such circumstances, it is best to attempt the "Hit and Run" technique of number one. The second strategy does not work in New Play Control! Pikmin 2, as the creature is invincible while it is rising from the ground. The fourth method is effective, but hard to perform at times. The name "Man-at-Legs" is a pun on "man-at-arms", a professional soldier during the Middle Ages, with the word "Legs" referring to it being a member of the arachnorb family. The Japanese name for this boss is ダマグモキャノン?, which means "Cannon Orb Spider". Its scientific name is Pseudoarachnia navaronia. Navaronia is most likely a reference to the famous novel The Guns of Navarone, which are about artillery guns, referring to the Man-at-Legs's own gun. Alternately, navaronia is related to the Latin word navalis, which means "related to ships"; there could be a tie between cannons, used commonly on war ships, and the "cannon" part of its Japanese name. Internally, the boss is called houdai. ほうだい? means "artillery battery", once more referring to the creature's firepower. Get an image of the skin that's similar to the Beady Long Legs's. Artwork of a Man-at-Legs about to fire its cannon. A Man-at-Legs in the Secret Testing Range, firing its weapon. A dormant Man-at-Legs at the Subterranean Complex. Notice the web-like design on the floor. A dormant Man-at-Legs in the Hole of Heroes. Man-at-Legs emerges from its hole. Animation of a Man-at-Legs emerging. Olimar and Louie fighting two Man-at-Legs at once in an unused cave meant for enemy testing (last_4, sublevel 21). The creature's e-card, #32 (10th blue card). Spider web patterns are seen on the floor of its battle arenas, similar to the shadows of webs in the Beady Long Legs and Raging Long Legs arenas. In the caves that it is found in, the Man-at-Legs appears to be somehow "buried" in solid metal in its dormant form. Its legs also come straight out of the solid ground, which also doesn't make much sense. Holes in its metal plating reveal "skin" with a texture similar to that of the Beady Long Legs. An unused cave reveals that two Man-at-Legs were to be fought at the same time. It is unknown how Louie knows how to cook this beast, as it explodes after its health is degraded. This member of the arachnorb family is very different from its other relatives; it's the only one that doesn't crush Pikmin, fall from the sky (instead comes out of ground) and it is also the smallest known member. This page was last edited on March 23, 2019, at 17:44.